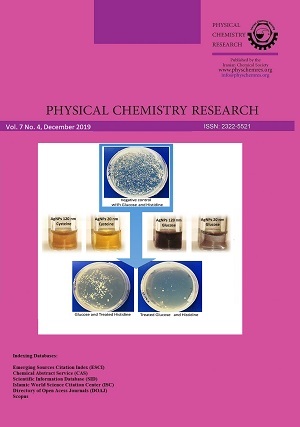 The effect of three organic aromatic salts - Phenyltrimethylammonium (PhTMAB), benzyltrimethylammonium (BzTMAB) and benzyltrimethylammonium (BzTEAB) bromides - on the micellization of sodium dodecylsulfate has been investigated by conductometric method. The critical micelle concentration (CMC) values were found to decrease with increase in the concentration of the aromatic ammonium salts. 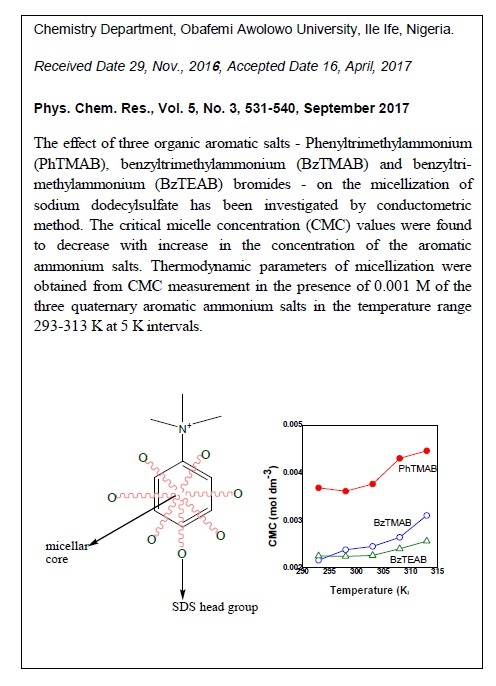 Thermodynamic parameters of micellization were obtained from CMC measurement in the presence of 0.001 M of the three quaternary aromatic ammonium salts in the temperature range 293-313 K at 5 K intervals. The Gibbs free energy values were generally negative in the presence of the aromatic salts and slightly varied with temperature. The micellization process was both enthalpy and entropy driven. Enthalpy-entropy compensation was observed for all the system with a constant compensation temperature values around 302 K and negative intrinsic enthalpy of compensation.